BFKendall Jenner and Gigi Hadid tapped into their artistic sides for a cover shoot. 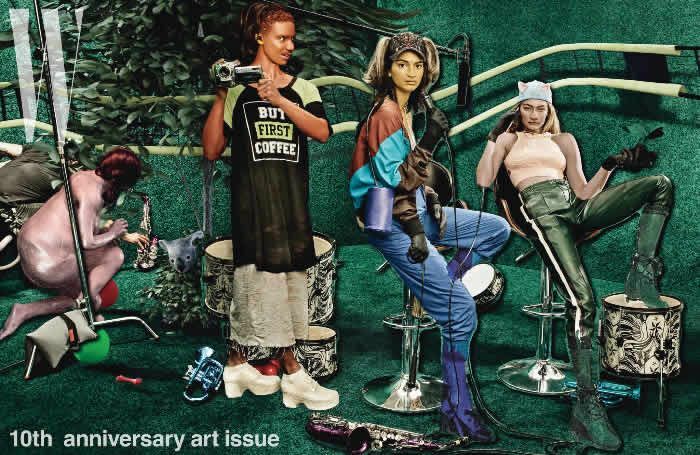 For W Magazine's 10th anniversary art issue, BFFs Kendall Jenner and Gigi Hadid tapped into their artistic sides for a cover shoot. Titled "Placebo Pets," the project featured body paint, tulle gowns, paper walls, and oh yes, even a puppy. Inspired by the models' close friendship they are known as KenGi after all artists Lizzie Fitch and Ryan Trecartin worked with the girls to give them a makeover in which they had animal-like qualities, essentially creating the idea of friendly "humanoid pets." While some loved this artistic expression, other readers raised questions on the extent of digitally manipulating Gigi and Kendall's bodies and faces for the cover. Regardless of the different opinions, however, Kendall and Gigi appeared to have a blast on set, laughing and posing in printed dresses while stepping out of a tent. The two even came together for a performance art piece and shot some BTS snaps that proved their friendship is as real as it gets. Scroll on to see all the images from W Magazine's art issue and then watch Kendall and Gigi in a stare-down challenge.